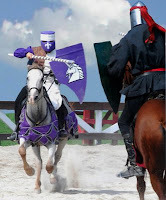 Two more Renaissance Faire pictures. Stylized to remove the tourists. Who wants tourists with fanny-packs encroaching your historic fantasies? 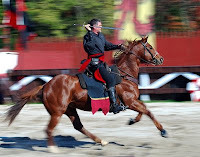 Here are 2 motion studies from the PA Renaissance Fair. The first uses a long lens which follows the lateral motion of the horse during exposure (1/60th"), creating a blurred background and simulated 2D motion. 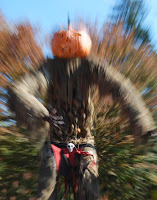 The other photo of the pumpkin man was forward motion created by zooming the lens back during exposure at about 1/30". Prepare to take many exposures to nail the right image. These exposures require a tripod (or at least a mono-pod) to be effective. 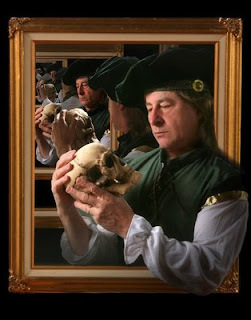 This is a self-portrait, reminiscent of Hamlet ( "Yorick, I knew him well Horatio"). It was an attempt to capture the infinite mirror effect which is virtually impossible with a camera. All images were Photoshopped in layers--about 15 layers in all. No actual mirrors were used! 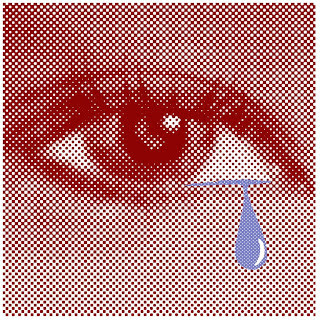 This image is actually a close up photographic study of a female eye with the blue tear drawn in using Photoshop. The unique thing about this image is that it looks like close-up newsprint. This is done using a halftone filter from the filter selections. Unfortunately the photo needed to be manipulated considerably before the filter could be effectively applied. This image, as simple as it appears, took me about 4 hours to create. I tried to catch the essence of October in this photo, trying to steer away from the cliche pumpkins etc. These Gumballs must be filled with helium. This was actually two exposures. One a standard still life setting with the base on the seamless background. The other exposure was challenging. 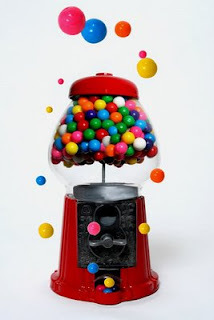 I had to turn the gum ball machine upside down and lower the light source to give the impression of anti-gravity. 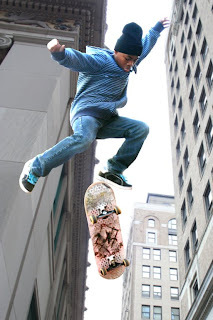 In Photoshop I joined the inverted globe with the base photo. 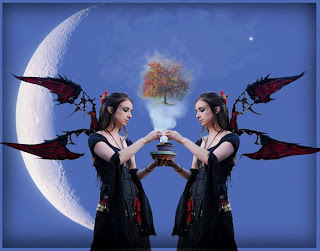 Here's another fantasy. A stylized still life. 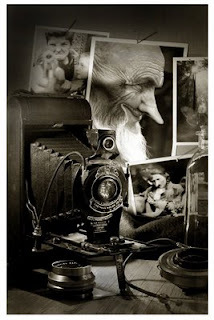 The photos in the background supposedly taken by that old Kodak relic and the weird elf-like face on what appears to be a portrait of the photographer give this photo a magical yet foreboding appeal. Also I lit the set with candlelight only and used aluminum foil as a reflector. This Altered reality image is a tribute to the fountain statue at Archmere Academy in Claymont DE. The statue depicts a "puck-like" character stealing wine from a wineskin worn by a traveler. He did this by puncturing the wineskin and drinking the dribbling wine. 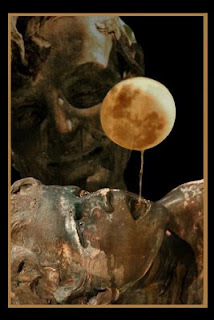 It's a fascinating sculpture and inspired this image which hopefully does NOT glorify intoxication. My photo is called Drink Down the Moon (from the old expression "Drink down the Moon, Drink up the Sun" -- an all-nighter). 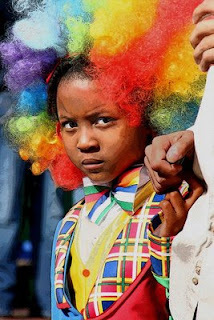 Here are two photos I entered in the DE Photo Society competition for Jan 09. I call them urban fantasies. One, I photoshopped in a grand background the other is posterized.